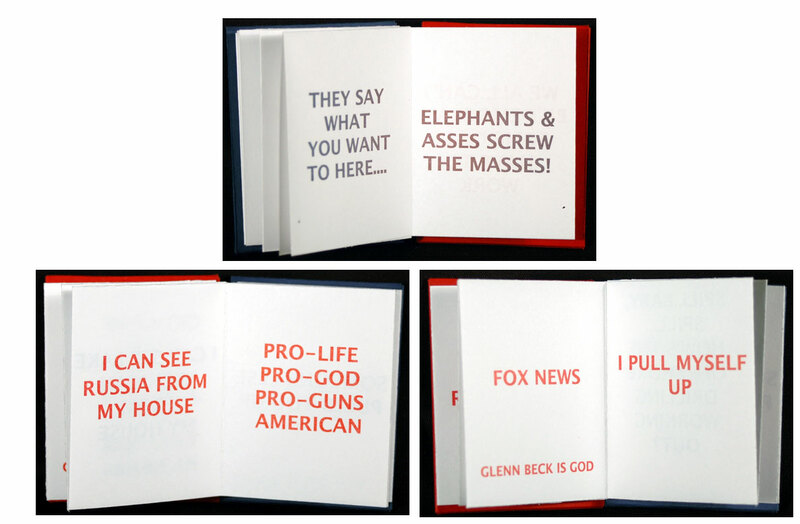 Chicago, Illinois: Journal of Artists' Books, 2015. 5.5 x 9"; 10 pages. 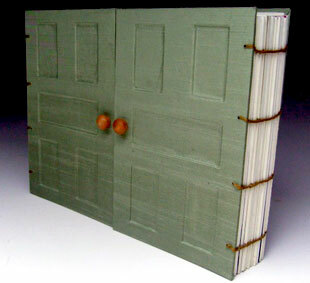 Variation of a dos-a-dos binding. Pamphlet with saddle stitch binding (stapled). Printed on a Heidelberg GTO 52 on Mohawk Superfine paper. 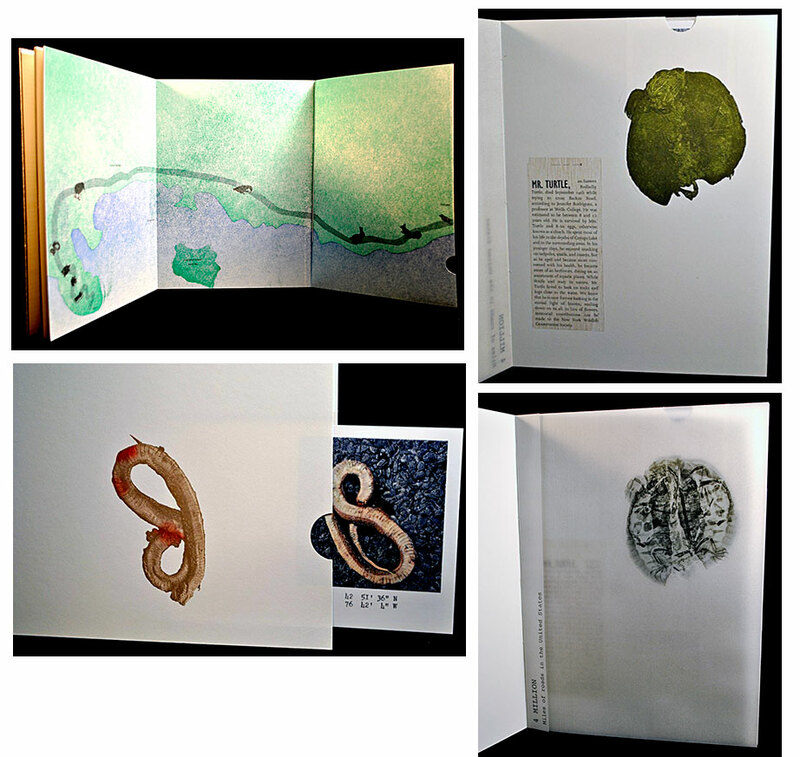 Designed, offset printed, and published by Jenna Rodriguez during her summer residency with the Journal of Artist Books (JAB) at Columbia College Chicago in the Center for Book and Paper Arts. Jenna Rodriguez: "Three weeks after I moved to the shores of Cayuga Lake, the local gas station was barricaded with trucks, police, and members of the local Cayuga Tribe. This event inspired me to explore the long history of the Cayuga Nation and the events that lead to the recent conflict within the tribe itself. Depending on which cover you open first you receive a different story. One side of the book tells the 'Now' story (current issues) and the other side tells the 'Then' story (history) of the tribe. "In 1779, the U.S. military destroyed the nations homes and crops forcing them off their land. Ten years ago, Cayuga Nation returned to their homeland after being displaced across the U.S. and Canada. The land claim is situated on the north end of Cayuga Lake, which is part of the Finger Lakes Region in Central New York. The nation is currently split between two factions and for two months one faction hijacked their gas station. This book tells the story from multiple perspectives. The central theme of this book consists of my photographs, newspaper articles, letters from the local councilman, historical research, and conversations with the Cayugas and Mercenaries. Moving to this area has made me aware of the continuous struggle Native Americans encounter. Through this book I hope to bring attention to their plight." Chicago, Illinois: Jenna Rodriguez, 2013. Edition of 28. One page book: 2.9 x 5.5" closed, 8.5 x 11" unfolded. Designed and letterpress printed by the artist. Three-color pressure print. Laid in black paper envelope wrapper with slip-and-slot closure. Title in gold foil. Signed and numbered by the artist. 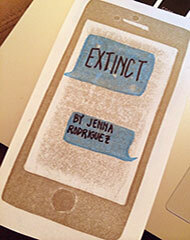 Jenna Rodriguez: "Extinct is about the evolution of communicating and how face to face interaction is becoming extinct. 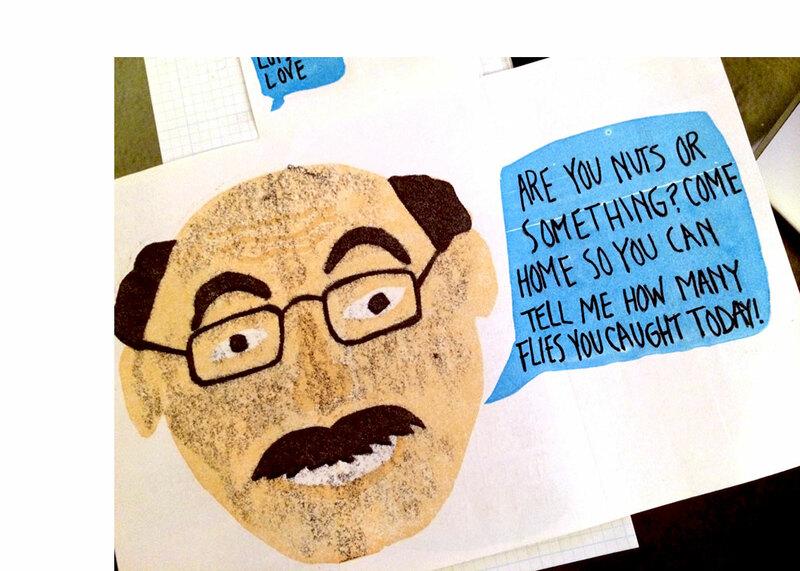 The book is a texting conversation I had with my father. He is trying to adjust to technology and he is creating his own abbreviations. It is hilarious because I do not understand him and he gets frustrated. 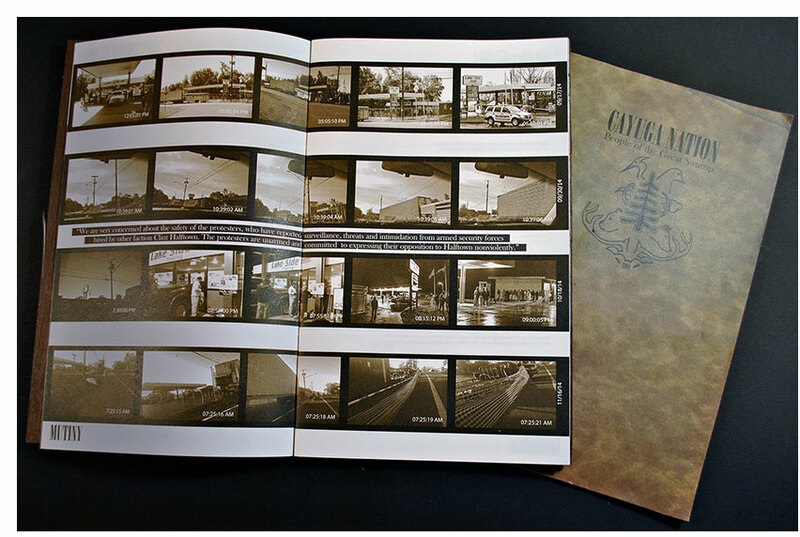 The images are pressure printed and the text is letterpress printed." Chicago, Illinois: Jenna Rodriguez, 2013. Open edition. 4 x 4.75"; 46 pages. Offset printed on French's 50 lb newsprint extra white. Bound in illustrated covers printed on Astrobright black paper. Printed on a Heidelberg GTO 52 with Helvetica CY typeface. Saddle stitch binding. This little book offers statements that Rodriguez overheard and collected from strangers while on Chicago's public transportation. Chicago, Illinois: Jenna Rodriguez, 2013. Edition of 35. 11.5 x 6"; 12 pages. Double-sided accordion with wraparound covers. Letterpress printed on Carnival Mohawk 120 double thick cover paper using a Vandercook SP25 press. Printed at Columbia College Chicago in The Center for Book and Papers Arts. Signed and numbered by the artist. 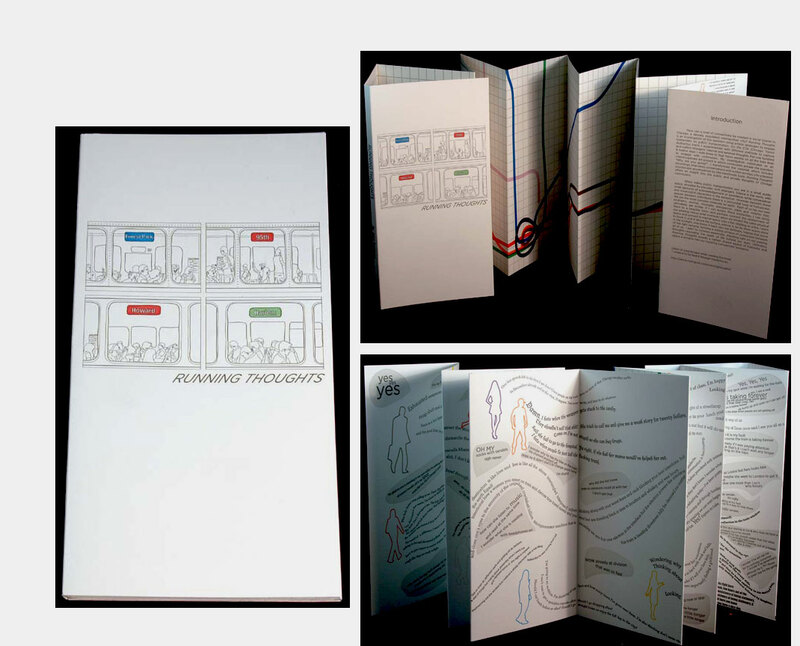 Running Thoughts was created for Rodriguez's thesis project in the Columbia College Book and Paper program. Jenna Rodriguez, Introduction: "How can a level of connectivity be created in social spaces in Chicago, a densely populated metropolitan city? Running Thoughts is an investigation of this question using artistic strategies to engage bystanders on public transportation. On the CTA (Chicago Transit Authority) trains I experimented with different methods to capture and collect strangers' internal and external thoughts. For one hundred & twelve days I rode three to four hours weekly on all the train lines to engage with commuters. My investigation culminates as an interdisciplinary art project in which commuters answer the question, 'Why are you going?' 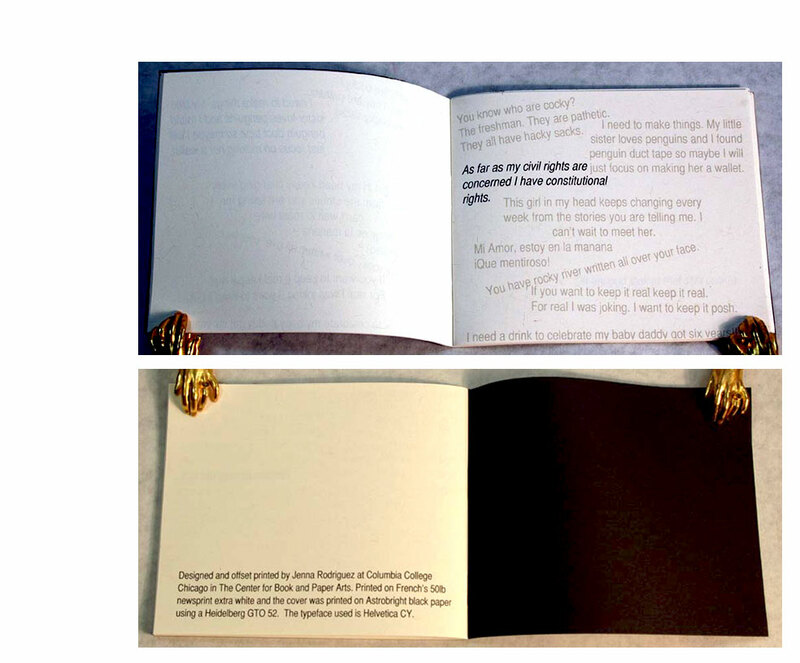 I transformed the material, which includes recordings, interviews, conversations, and written surveys, into a layered soundscape accompanied by the handmade book. Running Thoughts offers an insight into the public and private thoughts of Chicago commuters." Chicago, Illinois: Jenna Rodriguez, 2013. 2.5 x 3"; 64 pages including front and back covers. Perfect bound. Ball chain looped through punched hole in upper left corner. Offset printed. Jenna Rodriguez: "Are you breaking the common courtesy rules of public transportation? Or do you see others breaking the rules? 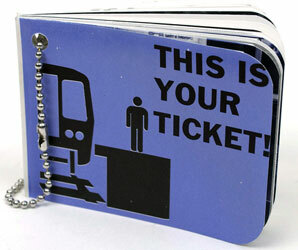 This helpful travel booklet features commuting etiquette as well as tear-out cards that can be distributed to offenders." Chicago, Illinois: Jenna Rodriguez, 2009. Edition of 25. 2.25 x 3"; 14 leaves. Letterpress printed. One-sheet book folded into sections. Double sided, a version of a reversible structure. Removable spines on either side. Paper covered boards, one in blue and one in red. Jenna Rodriguez: "Political Words of Wisdom was inspired from the two diverse communities of politics. The form allows the spine to be removed on either side to tell two stories. I want the viewer to explore the book. Depending what side the viewer opens they will see different stereotypes of people who consider themselves Republican or Democrat. I did not want the book to be biased for either party. 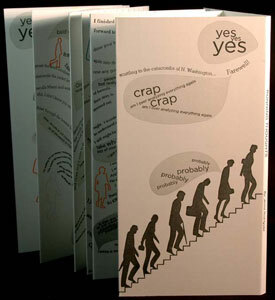 The book can also be read as a conversational piece where you flip back and forth from side to side. Political Words of Wisdom demonstrates how people constantly have to identify themselves." Chicago, Illinois: Jenna Rodriguez, 2011. Edition of 5. 5.25 x 7 x 1"; Turkish map fold (10 x 8" open), 9 (4 x 6") cards. Designed and printed by Jenna Rodriguez at Columbia College in Spring of 2011. Letterpress printed on Crane's Lettra.Text set in Helvetica Neue, Myriad Pro, and Futura. 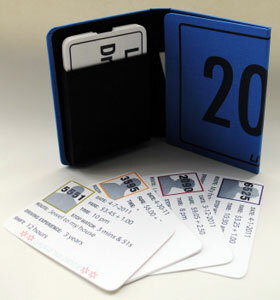 Trifold case with magnetic closure. Interior pocket for interview cards. Jenna Rodriguez: "Through the use of language and social engagement in the public sphere, I explore everyday life, which opens a dialogue, allowing me to investigate different avenues to create narratives. ... I seek to give our private thoughts a voice, and our public thoughts an amplifier. By giving them a voice, it empowers their creators and allows us to stop, listen, enjoy, and realize that everyone, all around us, drinks from the same cup of humanness. I do not want to manipulate the public but I am interested in documenting them as a work of art. I consider myself a collector, observer, and artist.Interviews conducted during routine taxi rides throughout the city." Rodriguez conducted interviews with cab drivers during taxi rides throughout Chicago. There is a card for each interview. On one side of card she states date of ride, amount of fare, time of day, length of ride, route, length of time the cabbie has been driving a taxi cab. On the opposite are anecdotes she passes along from the cab driver. Includes map of Chicago as a Turkish map fold with routes taken highlighted. "To avoid trouble I pay close attention to the people I pick up." "Attitude! People are rude and don't respect me." 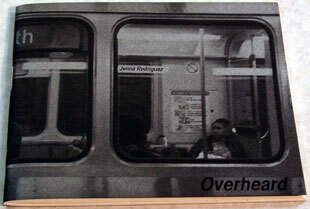 Chicago, Illinois: Jennifer Rodriguez, 2009. Edition of 2. 12.25 x 9 x 2"; 84 pages. French door structure. Exposed Japanese stab binding each side. Inkjet printed. Images mounted on Matt board. Text printed using image transfers. Front and back boards cloth covered. 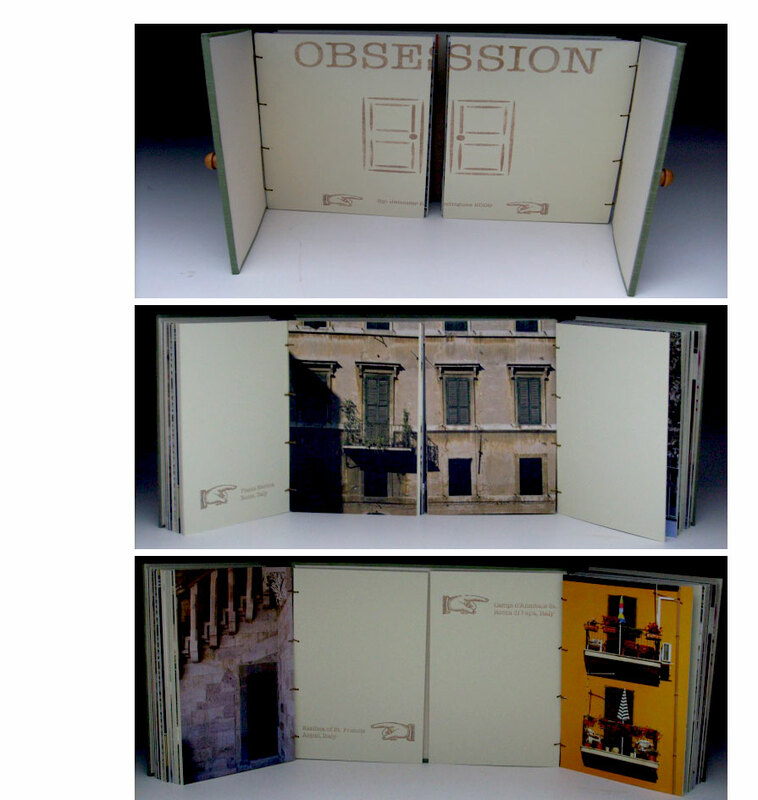 Jenna Rodriguez: "Obsession is a massive book of photographs of doors from all over the world. It illustrates my obsession with doors. For three years I documented doors from my travels. Doors lead to another world and what is occurring on the other side of the door intrigues me. Every door has character and an untold story behind it." Each door is identified in general terms, for example, "Near the Spanish Steps, Rome, Italy." What's behind the doors is left to our imaginations. Chicago, Illinois: Jenna Rodriguez, 2009. Edition of 12. 3 x 4.375"; 8 booklets. 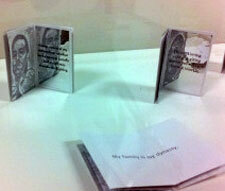 Each booklet made from one sheet of paper, and each containing 5 pages. Letterpress printed and pressure prints. Housed in reflective silver slipcase. 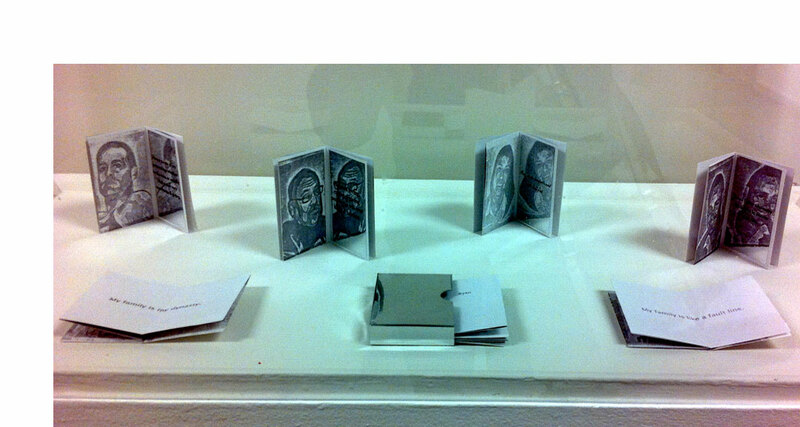 "Reflect is an artist book about how my family identifies both themselves as individuals and as a family. Coming from a large family with six children, my parents developed their own community. Humans identify and classify people in their own community and create internal thoughts about each other. "For instance, 'That's my brother. I love him because he is my family.' This work explores what it means to consider family perceptions from different points of view. "For the content of the book, I interviewed each member of my family and asked: If you had one chance to tell the world what kind of person you are in one sentence what would you say? How do you describe your family as a whole, and in a few words how do you identify each family member? "I produced eight individual books: one for each member. In each book, there is a list of letterpressed words the other members of the family chose to describe that particular member. 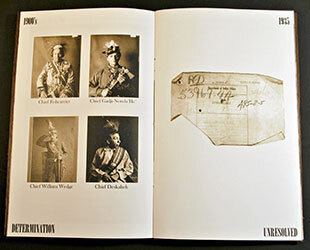 A pressure print portrait represents that person and on the page opposite, metallic paper represents a mirror with letterpressed text on top of it. Upon opening the page, on the portrait of the person reflected is a sentence revealing how he or she identifies [himself or herself] as an individual. "I chose a representative typeface for each family member merging their personality and the visual characteristics of the typeface. For instance, my youngest brother's typeface is Cooper Black because the characteristics of Cooper Black look very child-like and playful. On the last page of every book is how each member describes the family as a whole. "There is a surprise on the backside of the books. When unfolded, all eight books create a puzzle that can be put together to view my family portrait, which is not a detailed image because it represents the family as a whole not as individuals. "Christmas morning I gave each member, a complete set of all eight books and had them open them all at the same time. Interestingly, they immediately went to the book about themselves and read a line out loud trying to figure out who said what." Aurora, New York: Jenna Rodriguez, 2015. Edition of 30. 9 x 12"; 28 unnumbered pages. Letterpress printed with the exception of the digital x-rays. Joanna type cast at Michael and Winifred Bixler Letterfoundry. Animal illustrations scanned and made into polymer plates. Printed on Strathmore Premium super smooth soft white paper and Curious Skins translucents. Bound in handmade paper from recycled clothing. 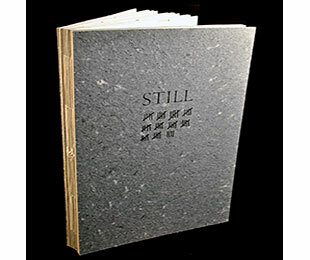 Designed and printed by the artist while at Wells College Book Arts Center as the Victor Hammer Fellow. Signed and numbered by the artist. Jenna Rodriguez: "Still memorializes roadkill I encountered in the Finger Lakes of Upstate New York. Moving from Chicago to Aurora, New York, I was overwhelmed with my daily encounter of roadkill. The book transforms into a creative non-fiction narrative allowing me to connect with my environment. The deceased animals were found on my daily commute and treated with respect. The cover is handmade paper to resemble asphalt. The book proceeds with an image of crows around an animal to represent the flight of their soul. Following is a pullout map indicating where animals were found. 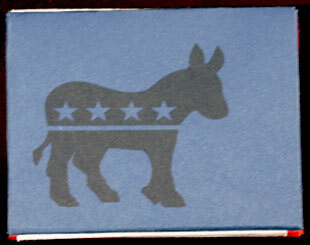 Animals are letterpress printed in two colors with linoleum blocks and polymer plates. A veterinarian allowed me to take x-rays, which are printed on transparent paper with vertical text stating statistics about roadkill. Each animal has an obituary that states factual and humorous information with a pullout photograph showing the crime scene and the longitude and latitude. At the end of the project a private ceremony was held where the animals were buried on an island to pay respect and give thanks." Colophon: "The animals were found along Route 90 on my commute to and from Wells. Nicholas Rodriguez and Cosmo Carelli wrote the obituaries. During the process of creating this book I had interesting conversations with local veterinarians and taxidermists who were puzzled by my questions and laughed awkwardly. They insisted I start doing taxidermy myself. The tally marks represent every deceased animal I passed on Route 90 for one month which consisted of 20 squirrels, 2 possums, 7 raccoons, 6 birds, 1 goose, 1 turtle, 5 frogs, 1 woodchuck, 6 deer, 1 dog, 2 skunks, and 2 unknown."